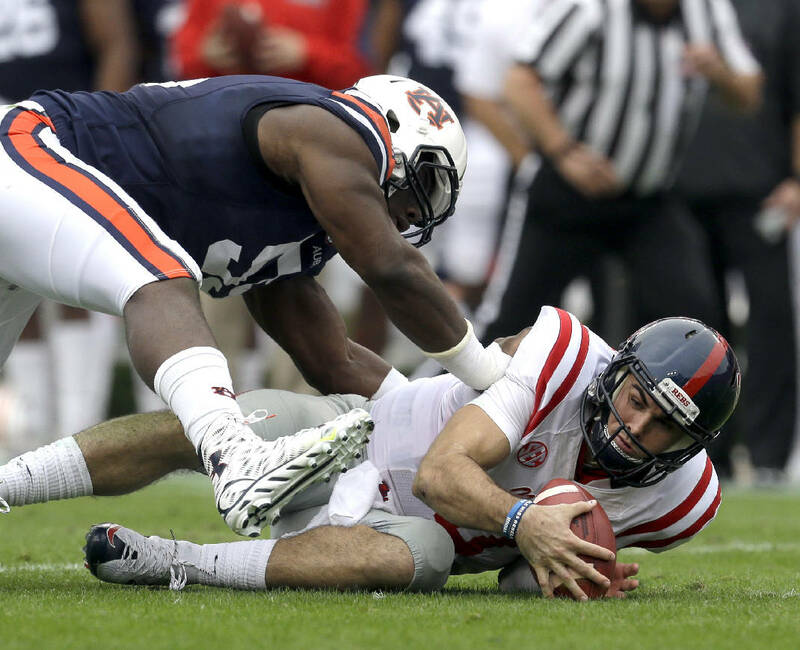 Auburn defensive end Carl Lawson tackles Ole Miss quarterback Chad Kelly during last year's meeting at Jordan-Hare Stadium. Lawson missed nearly half of last year with a hip injury after missing all of the 2014 season with a torn ACL. 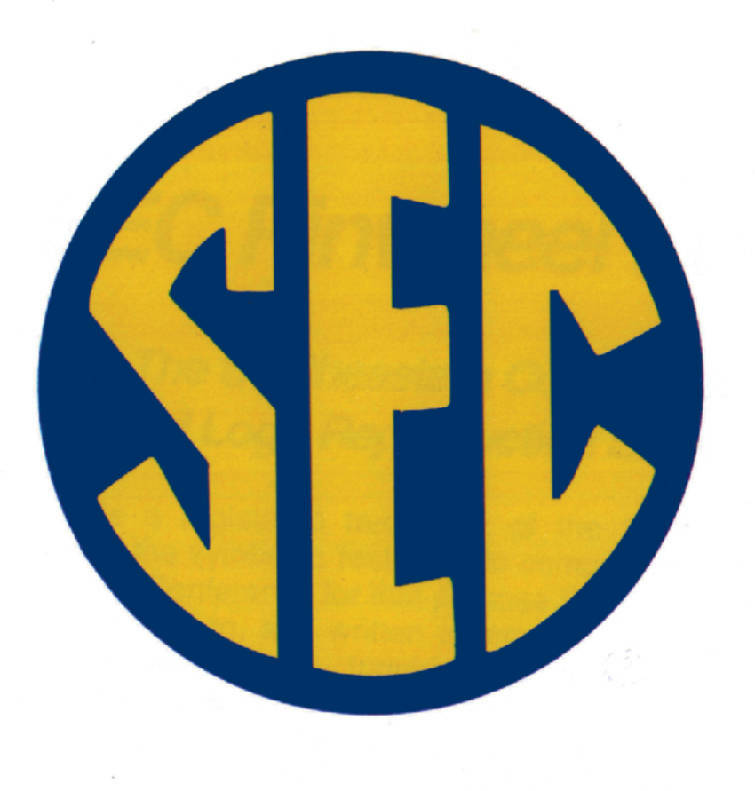 › Fun fact: Auburn has just two winning SEC records in the last eight seasons but won the league and played for a national championship on each of those occasions (2010 and 2013). Carl Lawson was living quite the charmed life. The nation's No. 1 defensive end prospect in the 2013 signing class, Lawson tallied 7.5 sacks as a true freshman on an Auburn team that upset undefeated Alabama, won the Southeastern Conference championship and came within 13 seconds of knocking off Florida State for the national title. Then misfortune started appearing — again and again. Lawson tore a knee ligament during spring practice in 2014, which sidelined him for that entire season. He returned to the lineup for last year's opener against Louisville, only to suffer a hip injury that knocked him out of the next six games. "Of course it's been frustrating, but we all have adversity in our lives," Lawson said last week at SEC media days. "You can either choose to lay down or get up, and I've chosen to get up." Lawson had three quarterback hurries, two tackles for loss and a sack against Louisville before getting injured. Thanks in part to his efforts, the Tigers built a 24-0 lead, but they had to hold on for a 31-24 triumph. Auburn could have used the 6-foot-2, 253-pounder from Alpharetta, Ga., during its embarrassing 45-21 loss to LSU, and Gus Malzahn's Tigers were better defensively when he returned. They allowed just four offensive touchdowns in their final three league games against Texas A&M, Georgia and Alabama before smothering Memphis 31-10 in the Birmingham Bowl. "He's a game-changer," Malzahn said. "When you have a guy like that, it changes everything, and it really makes people better than maybe they are, or it hides some of your deficiencies. He's got that ability. He's had the ups and downs with his injury, and I think from a coach's standpoint you learn. "You've either got to prepare with or without him, but he's at his best right now. He's at his fastest and quickest and strongest he's ever been. He's very competent. He's a wonderful young man, and I really expect him to stay healthy." Lawson is three years removed from Milton High School and could have bypassed his final two seasons of eligibility for the NFL draft. Wouldn't he want to be receiving a paycheck the next time he suffers an injury? "Some people might say that, but that wasn't my thought process," Lawson said. "I still have a lot of things that I want to accomplish, and it's what was best for me and my family." Auburn should be formidable up front defensively with Lawson, Montravius Adams, Dontavius Russell and Byron Cowart, and the secondary returns starters Johnathan Ford, Carlton Davis and Tray Matthews. The question for new coordinator Kevin Steele is at linebacker, where Kris Frost, Justin Garrett and Cassanova McKinzy have moved on. Tre Williams is Auburn's top returning linebacker in terms of tackles, having tallied 55 last season as a sophomore. Deshaun Davis and Jeff Holland also are potential starters after showing promise as freshmen. Steele is the third defensive coordinator in as many seasons, having replaced Will Muschamp, who replaced Ellis Johnson. "Change is sometimes good," Lawson said. "In the NFL people have different coordinators, and being able to adapt makes you good. You have to get used to different terminology, but it's been an easy transition, and everybody likes Coach Steele. "I think it will be a good fit." Lawson is scheduled to graduate in December and could announce, providing he enjoys an overdue season of health, in January that he will forgo his final year on the Plains. That is not, however, his immediate focus. After all, he may be just getting started. "I need more experience in college football," Lawson said. "I haven't really played that many games, because I've been hurt, and I didn't play much early in my freshman year. It's been unfortunate, but the more experience I get, I do feel like I become a better player. "I feel more like a second-year guy, because I haven't played that much."